Here is a refreshing, cool soup perfect for a warm day. If that isn’t enough to recommend it, it is also quick and easy to prepare. A simple, charming soup for a backyard bbq, easy to make ahead and keep chilled in the icebox. When ready, just bring it out and ladle into bowls or mugs. You could garnish it with fresh mint sprigs - if you are growing mint in your garden you may need to thin it out anyway. Enjoy this Orange-Tomato soup soon. Another delicious recipe, Anthony. 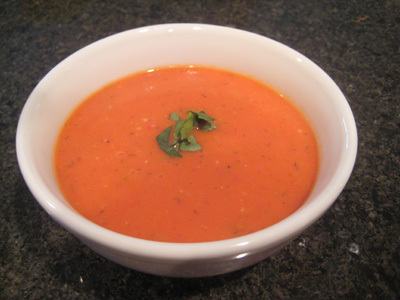 The last tomato soup I made didn't turn out so well, so I will give this one a try. LYNN PROCTOR: It's great on a hot afternoon. SUSAN OLOIER: This one is pretty easy and goes great when it's hot out. JEAN: Thank You Jean, it's a great chilled soup. I like the sound of this recipe! And it looks really good. Hmm, sounds really good, I haven't had tomato juice in a long time, thanks for these recipes. So yummy. Boy, I've visited quite a few food related blogs today and I'm hungry!! I'll never be able to eat of those amazing things but tomato soup can actually work with my diet. Thanks! This is me, Duncan D. Horne, visiting you from the A-Z challenge, wishing you all the best throughout April and beyond. Sounds interesting. Never thought of adding orange juice to a soup. THE GOLDEN EAGLE: Ha, wait till you taste it. RCH: Remember this on a sunny day. GINA: The simplicity of this soup is worthwhile. DUNCAN D HORNE: Thanks for your compliment, best regards to you and your family. SPICE UP THE CURRY: Thank You for your kind words. SUSANNE DRAZIC: Orange juice complements this soup well.